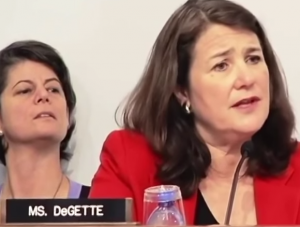 Colorado Peak Politics | PREPARE THE SMELLING SALTS: DeGette and Polis Support Fracking! PREPARE THE SMELLING SALTS: DeGette and Polis Support Fracking! Have you heard the joke about the politician who got ran over, because she tried to stay in the middle of the road when she opposed an issue that many of her constituents supported? According to a publication that is not The Onion, DeGette said SHE SUPPORTS FRACKING. She totally and truly and absolutely said it, according to Climate Wire, an industry watch publication. And lucky for her, Climate Wire requires a pricy subscription to get behind the paywall to read the article, which by the way was authored by former Denver Post reporter Mike Soraghan. So she supports fracking, she just wants to cripple the industry with redundant, yet expensive federal regulations. We suppose DeGette also supported fracking when she made that cameo appearance in the controversial film “Gasland,” where she suggested the process threatened drinking water. The article goes on to suggest that U.S. Rep. Jared Polis, fractivist kingmaker, also supports fracking. Reps. Jared Polis (D-Colo.) and Matt Cartwright (D-Pa.) expressed similar sentiments. Polis said local communities should decide, and Cartwright cited the increased supply of natural gas made possible by new production methods as a stopgap source of energy while the country moves to cleaner sources. So, out of this group of lawmakers introducing bills intended to block fracking, we have DeGette who supports fracking, but believes it pollutes the environment, Polis who supports fracking, but wants local-control bans, and Cartwright who is pro-fracking, except he’s really pro wind and solar. The only lawmaker who openly acknowledged they wanted to ban fracking was Rep. Jan Schakowsky (D-Ill.). “There is good reason to think about, if these protections can’t be implemented, that we ban it,” Schakowsky said. The four House members held a conference call to announce introduction of the bills along with Margie Alt, executive director of Environment America. But there is no drive on Capitol Hill to ban fracking or drilling, and there is little appetite for the Democrats’ drilling regulation bills in a Congress controlled by Republicans. DeGette’s “Fracturing Responsibility and Awareness of Chemicals (FRAC) Act” didn’t get a hearing when Democrats controlled Congress. At last, the truth comes out! Lawmakers must first cripple the industry, until they can work up enough political muscle to outright ban it. Until then, we truly hope they try and maintain their middle-of-the-road stance.